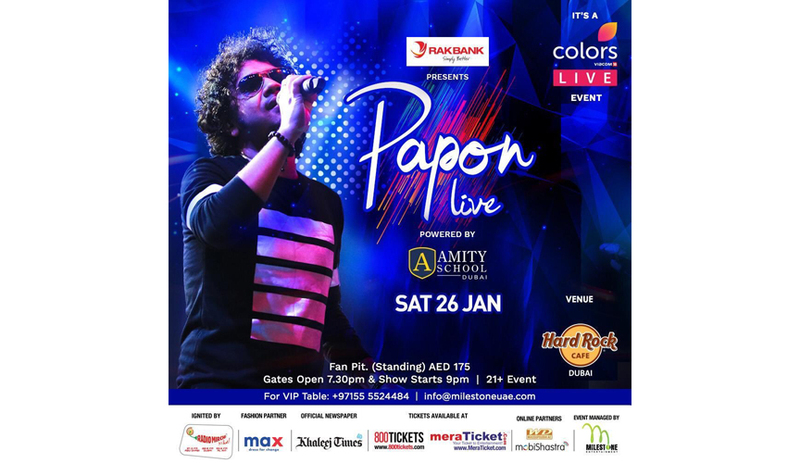 Bollywood singer from Assam, Angaraag PaponMahanta promises a night of foot-tapping music during his performance to be held at the Hard Rock Café, Dubai Festival City on January 26, 2019. While uploading a promo of the event on his Twitter handle on Tuesday, Papon has invited his fans and get tickets for the live musical event which will start at 9 pm. However, the gates will be opened from 7:30 pm onwards. Papon, who has deep roots in the classical and folk traditions of Assam, has carved a niche for himself as one of the most versatile artistes in the Indian music industry. On the query whether he attempts to infuse folk music elements from Northeast India when he composes songs for Bollywood films, the singer from Assam said: “It would all depend on the story and the song. Having said that, I have composed for a few films. In a couple of movies, the situation did not require or have any scope for indigenous sounds, but if you listen to my song Yeh Tishnagi, it does have an element of ‘Ghoxaa’ in the melody, which is a devotional form of Neo Vaishnavite music in Assam.